The Villa Maria Letizia, aristocratic home of Contessa de Franceschini in Liguria, is situated in tropical parkland enveloped between two classical 5 star hotels of Sanremo. A path leads through the park to the beach below. These are the best sand beaches of Sanremo. There is a panoramic view of the bay from the villa, which is surrounded by bird song, even though only 5 minutes walk to the central casino and main shopping area of Sanremo, Liguria. All of the main rooms of the villa are overlooking the Mediterranean. The villa is placed immediately above the town. The apartment has recently been refurbished and has all the comforts combined with selected antique furniture. It has its own private car parking. The two bedrooms (one with balcony) and the sitting room all have good sea views. The large private terrace, directly outside the kitchen, which is filled with tropical flowers overlooks the bay and is ideal both for sun bathing and candle lit dinners. Sanremo is renowned for its entertainment. The music festival is in February, the International Firework Festival in July, the historic car rally in March etc. The summer season features live entertainment every night with live bands, fashion shows, open theatre and concerts. Sanremo has its own casino but is 15 minutes drive to Montecarlo, to visit the Casino or also perfect for the Grand Prix. The South of France and its amenities are 20 minutes by car. The town has unrivalled shopping facilities, especially its twice-weekly market. Contrastingly its surrounding mountains offer winter skiing only an hour distant at Limone Piemonte. The coast of Liguria offers whale and dolphin watching by boat and beautiful sandy beaches for lovers of the sun and water activities. The surrounding mountains allow visitors to explore the ancient olive trails, where the hidden medieval villages once a centre of which hunting, offer untouched medieval architecture. Whilst on the nature trails in the Maritime Alps, summer visitors can swim in rocky pools in the mountain streams or walk surrounded by butterflies. The villa itself, is a classic period building, its right on the sea with the beaches infront. From the villa is only 5 minutes walk into town. The apartment enjoys air conditioning in the main living room and overhead fans in the bedrooms. The apartment is on the second floor of the villa maria Letizia benefits from a large communal garden. 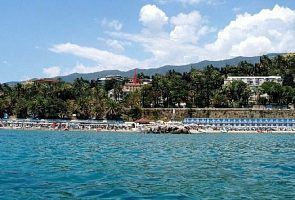 Sea bathing facilities and the extensive shopping facilities of Sanremo are only five minutes walk. We are happy to collect all guests from the railway station (free service) or from the local airports (Genoa, nice) at very competitive rates. Sanremo, Liguria is a seaside resort on the Italian Riviera, next to Montecarlo, some 20m minutes drive and Nice 45 minutes to the West and Genova and Tuscanny to the East. Liguria is situated between mountain and sea. Both Nice and Genova Airports are within an hours drive. The main sand beach of Sanremo is across the road. The Casino of Sanremo is 2 minutes walk as is the town centre, with it 's famous bars, cinemas and night life.